Ypres in Belgium, with its huge Menin Gate Memorial, is the epicentre of First World War remembrance. Every year thousands of British tourists – including school parties from all over the UK - descend on the town to observe the moving Last Post ceremony at the Menin Gate every evening and to visit the many surrounding war cemeteries and old battle sites of Flanders Fields. Yet few people know that Ypres was home to a large and lively British community between the wars, formed when hundreds of former servicemen returned to Flanders after 1918 to create and care for the war graves of their fallen comrades. It is this hidden story of the British in Ypres, and what they went on to achieve in the very different war against Hitler that followed, that has been uncovered by Ealing author Sue Elliott in a new book, The Children Who Fought Hitler, published this October. Those early gardeners of the new Imperial War Graves Commission (now the Commonwealth War Graves Commission) settled among the Flemish people, married local girls and started families. 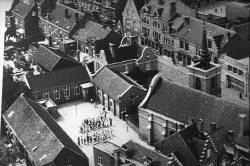 Soon they numbered several hundred and an Anglican church of St George and a British School were built in Ypres to cater for them. 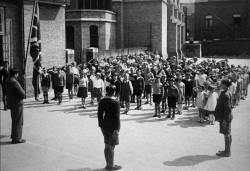 The British Memorial School, built with donations from Old Etonians in memory of their school-friends killed on the battlefields of the Ypres Salient, saw well over a hundred children passed through its doors in the ten years it was open. All the teaching was in English, they celebrated Empire Day and May Day, and had a regular stream of VIPs to see this ‘little sprig of Empire’ in Europe. Sue Elliott spent a year interviewing former pupils – now in their 80s and 90s and scattered all over Europe - to capture their experiences of life in this strange expatriate community and the story of the momentous events that followed. She worked closely with co-author Jimmy Fox, who was one of those pupils. He was four at the time of the German invasion and his research over ten years forms the basis for this intriguing story of everyday heroism. Sue will talk about the book and what she learned from writing it in a special event at Ealing Central Library on Thursday 8th October at 6.15pm. Tickets £3 in advance from the Library, or on the door. The Children Who Fought Hitler is published by John Murray on 29 October, price £20. A linked television documentary of the same title will be shown as part of BBC4’s Remembrance Season, on or around Remembrance Sunday, November 8th. Sue Elliott lived in Brentham Garden Suburb, one of Ealing's premier conservation areas, for more than 20 years and is chair of the Brentham Heritage Society. You Read About it Here First!